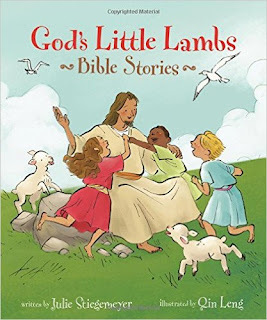 God's Little Lambs Bible Stories by Julie Stiegemeyer is a beautiful storybook Bible written just for little ones! I love that it has a padded cover and simple text that teach children about God’s love through stories such as Noah’s Ark, Jonah and the Big Fish, and Jesus Welcomes the Children. The illustrations are beautiful and my kids absolutely adore this book! I love reading this stories from this book to my kids before bed and love how relaxed and happy it makes them. God's Little Lambs Bible Stories by Julie Stiegemeyer is the perfect storybook Bible for little ones at bedtime or any time of day! You can find God's Little Lambs Bible Stories by Julie Stiegemeyer on Amazon, Barnes and Noble and other bookstores.